Side view of nine Merlin 1 first stage engines at base of second Falcon 9 rocket inside SpaceX processing hangar at pad 40. Ken Kremer for SpaceRef - Launch Pad 40 at Cape Canaveral Air Force Station, Florida: Pre-launch preparations for the blast off of the first operational Dragon spacecraft by SpaceX Corporation are rapidly picking up momentum following a successful launch countdown propellant test of the fully assembled rocket on Wednesday, September 15 at their seaside launch pad at Space Launch Complex 40 (SLC-40), Cape Canaveral Air Force Station, Florida. SpaceX spokeswoman Kirsten Brost told me they are targeting October 23 as the earliest date for liftoff of the Dragon reusable spacecraft to orbit on a 5 hour test flight atop a two stage Falcon 9 booster from SLC-40 in Florida. SpaceX granted me eyewitness access inside their launch facilities and rocket processing hangar at SLC-40 for a detailed up close tour where I observed the initial operational Dragon and Falcon 9 booster first hand after they had just been bolted together for the first time prior to the countdown test. 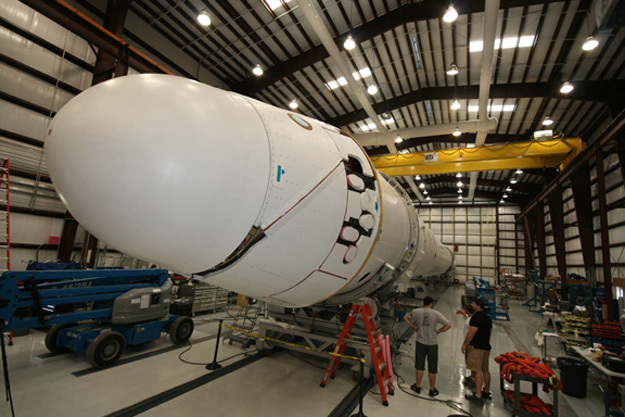 The rocket assemblage is undergoing pre-flight processing and checkout in the hangar. SpaceX launch facilities encompass launch pad 40 and the adjacent large hangar building. The rocket will be equipped with an aft looking camera to transmit dramatic launch footage during the climb to space. This is a busy week of critical processing milestones for the Falcon 9/Dragon combo in anticipation of the upcoming launch. Engineers moved the integrated rocket to the launch pad, where it was powered up by launch controllers and loaded with liquid oxygen and RP-1 kerosene propellants to conduct a key countdown wet dress rehearsal test. The test lasted about 5 hours and was "pretty nominal" according to SpaceX officials. Both stages were fully loaded, put through exercises and then de-tanked. My exclusive photos below unveil the first fully assembled operational Dragon spacecraft and Falcon 9 booster rocket, debuting here for the first time for all to see from my tour inside the SpaceX Cape Canaveral launch hangar at pad 40. Just hours prior to my visit a few days ago, SpaceX engineers and technicians achieved the significant operational milestone of the first joining together of the individual Falcon 9 stages and Dragon components into an integrated launch vehicle, while it was resting on roller carts in a horizontal configuration. SpaceX assembles the rocket components in a horizontal fashion to enable much easier access and quicker processing to all areas of the rocket for assembly, maintenance, adjustments and testing. I stood next to the rocket as it was gently rolled several times. This allowed technicians on standard ladders to rapidly and efficiently work on multiple rocket locations from top to bottom. And of course they were dressed in official SpaceX garb - T shirts and shorts. Saving time and money is the driving force at SpaceX in order to keep costs down compared to their competitors and thereby win lucrative launch contracts. That mantra was emphasized to me repeatedly by SpaceX engineers during my pad 40 visit. Continuous improvements are prudently implemented in an incremental fashion. The upcoming test launch - dubbed NASA COTS Demo 1 - will be just the 2nd flight of the 16 story Falcon 9 booster following the successful maiden launch on 4 June 2010. Key goals of the Dragon test flight are to launch and separate from the Falcon 9 booster, orbit Earth from 1 to 3 times, operate the flight computers and avionics, test the performance of the communications system to transmit telemetry and receive commands, demonstrate orbital maneuvering, guidance and navigation, fire the Draco thrusters, re-enter Earth's atmosphere, validate the PICA-X high performance heat shield material, deploy the three parachute main landing system and recover the Dragon spacecraft after a water splashdown in the Pacific Ocean several hundred miles off the coast of Southern California. The Dragon on the first Falcon 9 flight was an engineering model that remained attached to the second stage. The SpaceX team has designed and built a Transporter/Erector (TE) which serves multiple launch related functions. The TE transports the rocket back and forth between the processing hangar and the launch pad and also serves as the launch gantry. The TE was rolled on railroad tracks into the hangar this past weekend and loaded with the integrated rocket. The rocket was mated to the TE and is firmly held in place with a giant metal claw. The combined launch stack was rolled back out horizontally to pad 40 on Tuesday, Sept. 14 and vertically raised to its launch configuration. After finishing the test, SpaceX technicians will roll the stack back into the hangar over the weekend, says SpaceX. The next step is to remove the Dragon from the Falcon 9 and place it on a processing cradle. At some point in early October, the spacecraft will be fueled with hypergolics - monomethyl hydrazine and nitrogen tetroxide - retested and then reattached to the Falcon 9 booster. Fueling will only be done after confirming the launch date due to the toxic nature of the propellants. In mid-October, a static test firing of all 9 Merlin first stage engines will be conducted with an expected duration of three to five seconds - similarly to tests run by SpaceX prior to the first Falcon 9 launch. The test firing is planned for roughly a week prior to the actual launch. The goal of the static firing is to test launch pad propellant and pneumatic systems as well as the ground and flight control software that controls pad and launch vehicle configurations and assure that all systems are "GO" in expectation of a launch. SpaceX's possible October 23 launch date is sandwiched in between two other high priority launches - the Delta 4 Heavy on October 19 with a classified spy satellite and the final flight of Space Shuttle Discovery on November 1. Thus this Falcon 9 blastoff is slated for an exceeding active time period on the Eastern Range at the Cape. As such, any delay in the Delta IV Heavy launch for either technical issues or the vagaries of Florida weather could easily impact and push back the planned Falcon 9 launch. Normally an extra day is reserved on the rocket range in case a 24 hour scrub turnaround is required for the possible October 23 launch. SpaceX is planning to recover the first stage and has reserved one of NASA's SRB recovery ships for the task. SpaceX's spaceflight processing hangar is located just a hundred meters or so from the launch pad, well within regulatory requirements but still convenient. To give an idea of the close proximity of the pad and hangar, I took a short stoll by foot along the railroad path with SpaceX engineers that took perhaps two minutes. Dragon has been designed from the start to carry crew, and will act as a pressurized cargo carrier to transport crucial supplies including plants and live animals and equipment to the International Space Station (ISS) to partially replace the capabilities of the Space Shuttle when the orbiters are no longer flying come 2011. One day in the not to distant future, SpaceX hopes that an enhanced variant of the Dragon capsule may even carry US astronauts to low earth orbit as well. SpaceX CEO and founder Elon Musk says that a manned Dragon capsule could possibly be ready to fly in about three years from the signing of a contact with NASA. However, before that can be accomplished NASA still must issue detailed, complex and mandatory guidelines for any man-rated spacecraft that would succeed the Space Shuttle. Access to SpaceX and Launch Complex 40 (SLC-40) is highly restricted since the facilities are located on the US Air Force Base at Cape Canaveral, which lies adjacent to the Kennedy Space Center and the Space Shuttle Launch Pads. SLC 40 is centrally located at the northern end of Cape Canaveral and is surrounded by the most powerful rockets and their launch pads in the current US space fleet arsenal. On prior visits, I have toured all these rocket launch complexes. Read my Delta pad report here: http://www.spaceref.com/news/viewnews.html?id=1394. The Falcon 9 is an EELV class vehicle with 1.1 million pounds of lift off thrust. It directly competes for commercial launch contracts with the Atlas V and Delta IV rocket families built by United Launch Alliance (ULA) from pads directly adjoining pad 40. The Shuttle, Atlas and Delta pads were easily within my eyesight on the day of my excursion. It was quite a breath taking sight to behold which I'll report on in a follow-up article. SpaceX hopes to establish a Falcon 9 launch rate at pad 40 that supports approximately 12 liftoffs per year or one per month. Under NASA's Commercial Orbital Transportation Services (COTS) program, SpaceX plans three test flights of the Falcon 9 rocket and Dragon spacecraft this year and in 2011 to demonstrate delivery of cargo to the ISS as well as the capability to return valuable cargo to Earth. In December 2008, NASA awarded SpaceX a $1.6 billion contract to conduct a minimum of 12 flights and deliver at least 20,000 kg of cargo to resupply the ISS after the Space Shuttle is retired sometime in 2011. An option for additional missions could increase the cumulative total contract value to $3.1 billion. Meanwhile, competition to fly human spaceflight successor vehicles to the space shuttle is heating up. Boeing plans a crewed capsule by 2015. Lockheed Martin is pressing forward with their manned Orion capsule which could launch to orbit in 2013. Read my latest status report on Orion here and tour of the Orion spacecraft with photos here. Watch for my follow up reports inside SpaceX. All photos by Ken Kremer. This photo shows the second Falcon 9 rocket with first operational Dragon capsule bolted on top and newly assembled into integrated launch configuration inside rocket hangar at SpaceX Launch Pad 40 in Florida. The Falcon 9 is a two stage rocket, powered by liquid oxygen and rocket grade kerosene (RP-1). It uses the same engines, structural architecture (with a wider diameter), avionics and launch system as the smaller and less powerful Falcon 1. 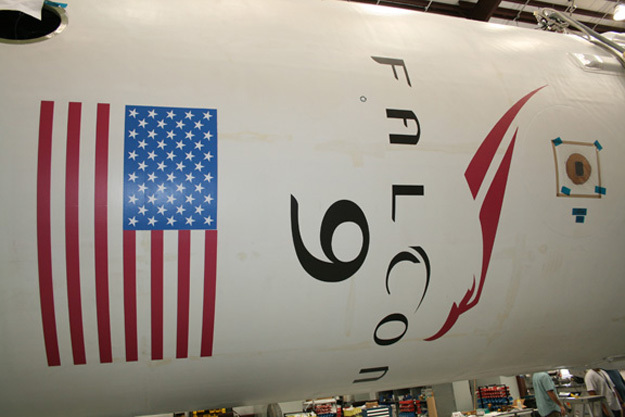 Close-up of decal on first stage of Falcon 9 rocket which will carry first operational Dragon spacecraft to orbit. 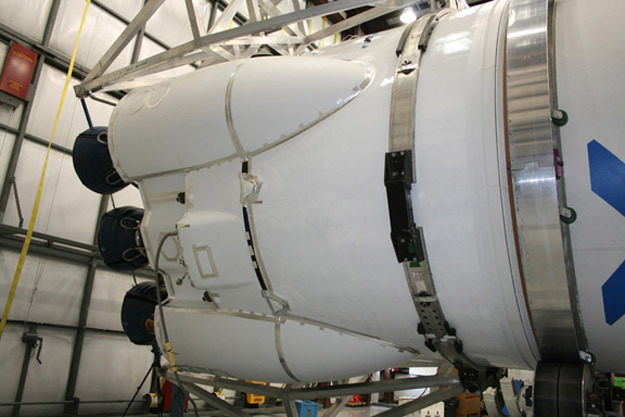 Rocket components are built in Hawthorne, CA and shipped to the Texas Test facility for acceptance testing. Final assembly is completed at SpaceX Pad 40, Cape Canaveral, Florida. 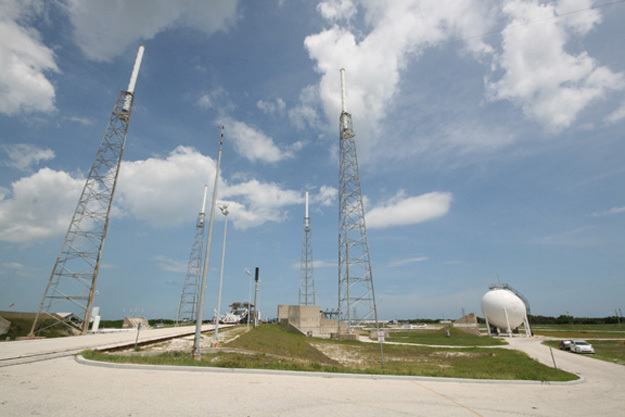 SpaceX seaside launch facility at Space Launch Complex 40 (SLC-40), Cape Canaveral Air Force Station, Florida. The Transporter/Erector at center travels along railroad track at left to move Falcon 9 rocket back and forth between hangar and launch pad. Second Falcon launch is targeted for 23 October 2010 at the earliest. Four lightning masts date from Titan rocket era. Liquid oxygen storage tank at right.